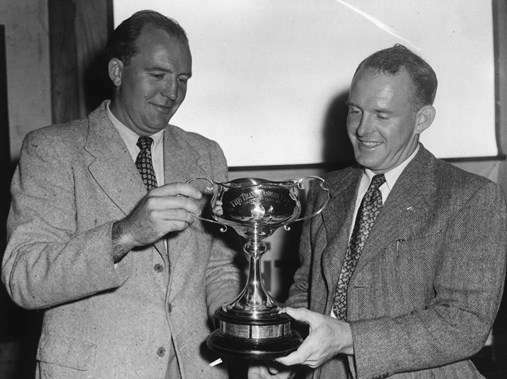 Magnus and Trygve Halvorsen with one of their winning Sydney-Hobart trophies. Photograph courtesy CYCA Archives. 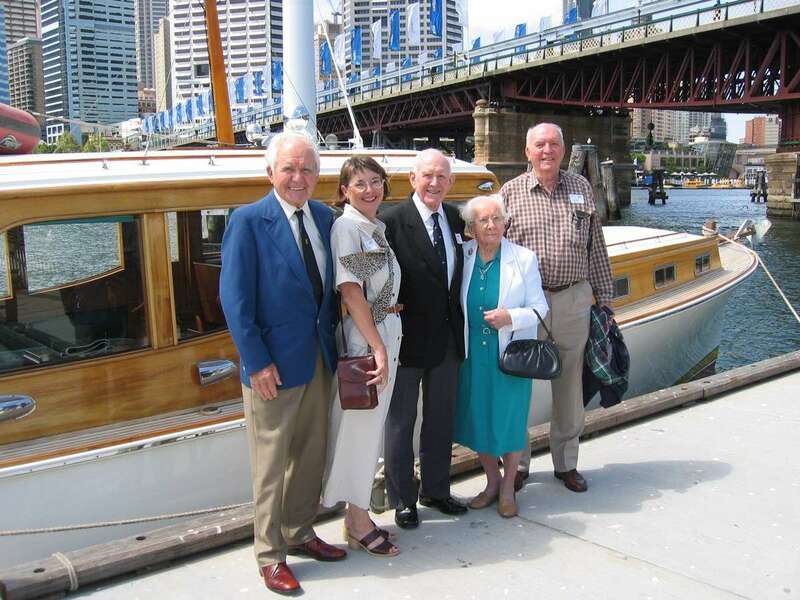 A generation of a family known for their classic wooden boat building in Australia has now come to an end with the passing of Magnus Halvorsen late in July, a month short of his 97th birthday. He was born in Norway, but migrated to Australia (via South Africa) as a child in 1925 with his mother, four brothers and two sisters. His father, Lars Halvorsen had arrived here in 1924, and established a boat building business in Sydney. 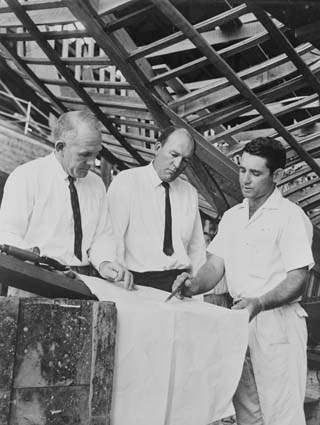 Members of America’s Cup team, 1962: Trevor Gowland (right) 29 year old foreman shipright, discusses plans for a new yacht with 41 year old Sydney boat builder Trygve Halvorsen (left) and 43 year old Magnus Halvorsen. Photograph by W Brindle. Courtesy National Archives of Australia: A1200, L41321. All five of the brothers — Harold, Carl, Bjarne, Magnus and Trygve — went to work in the family business when they turned 14. After Lars’s death in the mid-1930s it became Lars Halvorsen Sons. This is the name which is so recognisable around the country through the fine wooden motor craft they produced — boats that are collectors’ items and heritage craft today. Magnus could probably have stayed comfortably within that family fold, but instead joined in a business partnership with his younger brother Trygve (and with long-time colleague Trevor Gowland). Magnus and Trygve became legendary in Australian ocean racing history with a career that spanned almost five decades. The centrepiece will always be their hat-trick of wins in the Sydney to Hobart yacht race from 1963 to 1965 with the canoe-sterned, 39-foot-long Freya. This unmatched record is supported by a strong foundation. Freya on the Solent in the Admirals Cup. Private collection. Trygve and Magnus designed Saga for the second Sydney-Hobart race in 1946 in which they came second, but the strong conditions they encountered encouraged them to build a much more sea kindly yacht for their next race. Peer Gynt in 1947 was a big Colin Archer style hull that could withstand anything, and perhaps went a bit far in that direction. 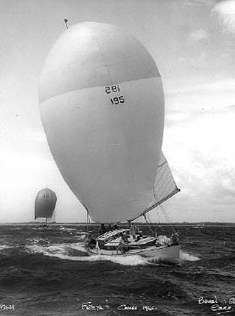 Solveig was next, with a smaller, lighter hull which won the 1954 event. It was skippered by long time crew member and navigator Stan Darling when both the Halvorsen brothers were unable to race because of illness. With Anitra V, they won the 1957 Sydney-Hobart and were second in 1956, 1958, 1959. Norla followed in the early 1960s before Freya came as the culmination of their talents. Freya was the sixth offshore racer they designed and built themselves and like the previous boats, they were designed primarily as good, fast cruising yachts that were raced. Freya’s construction began in 1962 while Trygve and Magnus were involved with the Gretel America’s Cup challenge where Trygve was a helmsman, then became leader of the maintenance program, towing and was the team’s ‘House Captain’, while Magnus was on the mainsheet. The backbone for Freya was made from the lofted lines and put aside until they returned from Newport in October 1962. Lines plan for Freya with the longer keel that Magnus wanted. At this stage Magnus asked Trygve to make a significant change to the design. The earlier yachts designed by Trygve had been built with a spade rudder separate from the keel, but Magnus wanted a hull that was very easy to steer and asked Trygve, “to retain the long deadwood we had in Peer Gynt”. 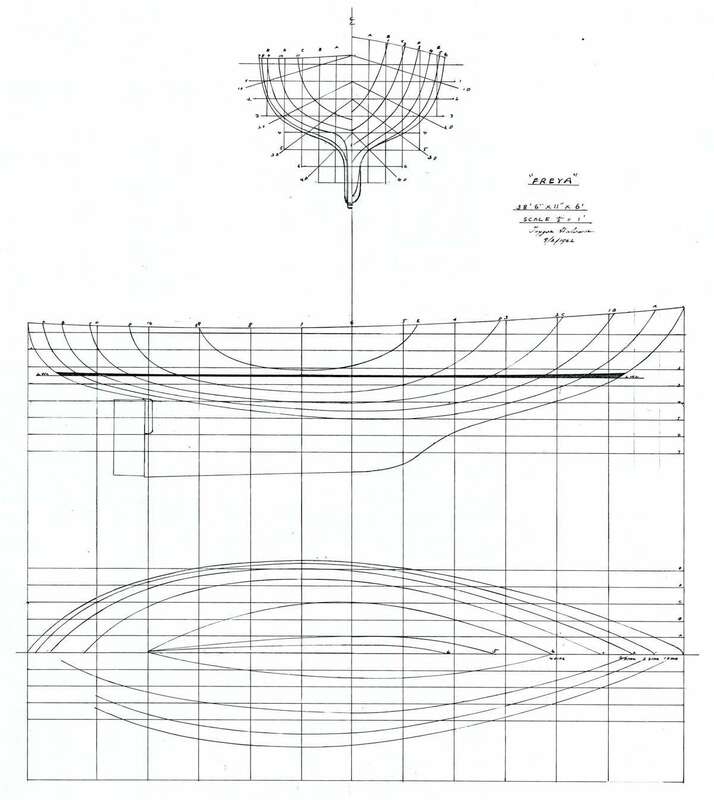 The original lines drawn in early 1962 by Trygve show how the keel ended well short of the spade rudder and this was located right aft close to the end of the waterline. The redrawn lines show the vertical rudder stock moved forward one whole station (about 3 feet) and a much longer keel. This helped the boat track very easily but gave the boat more wetted surface which made it slower in light airs. The original lines also show a name change; the original name for the yacht had been Helga, Solveig’s sister in the Ibsen story, but was changed to Freya early in the construction. … the long keel and deadwood gave her the underwater body of a contemporary 50–55 footer [15–17 metre boat]. She had that feeling of a much bigger boat at sea. With her large vertical rudder there was perfect control. She responded to the helm at all times. Never did she broach to! She carried a shy spinnaker longer than any competing yacht. Indeed, a spinnaker could be carried until it was aback, without rounding up. Freya could also carry full sail to windward in 30 knots of wind. After the 1965 win and their second place with Australia’s team for the Admirals’ Cup series in Britain Trygve retired from ocean racing to spend time with his family. Magnus took over Trygve’s share in the yacht and then largely cruised Freya with his wife and children. When it was put up for sale, no one in Australia was prepared to buy it as they felt they would be expected to win if they raced Freya again. Magnus then made the decision to sell it in the USA, and sailed it across with a delivery crew. After the pair parted ways as a sailing team, Magnus remained keen on racing and taught himself navigation to further his career offshore. He navigated Prospect of Whitby, top-scorer in Britain’s winning Southern Cross Cup team in 1973, Love and War in its 1974 Sydney-Hobart race win and again in the 1975 Admiral’s Cup. Amongst his most famous races were when he navigated Jim Kilroy’s American maxi Kialoa II to a line honours win in the 1971 Sydney-Hobart and then Kilroy’s Kialoa III when it set a new Sydney-Hobart race record in 1975 — one that stood for 21 years. Magnus and Trygve made a strong contribution to the Cruising Yacht Club of Australia, and were recognised for their services as joint Australian Yachtsmen of the Year in 1966. Magnus sailed in 30 Sydney-Hobart races, five Trans-Tasman races and three Transpac races along with thousands of miles of Pacific Ocean delivery passages. Magnus and his wife Paula (deceased) had four children, Ruth, Niel, Jan and Anders and our thoughts are with his family and their families. Magnus knew and respected the wind, the sea and the sky, and his spirit and ethos remains with yachts like Solveig, Anitra V and Freya – still at sea today where they are at home.